I've been very fortunate to receive my share, and maybe a little more, of press.....the free variety. 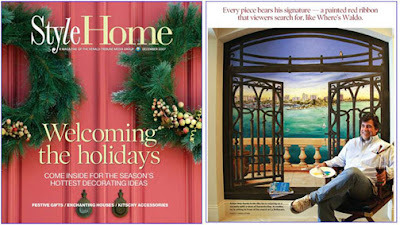 Back on December 15 of last year (2007), Nichole Reber wrote a very nice article about me and what I do for Style Home Magazine, which is part of the Sarasota Herald Tribune. Most people that read the article indicated that it was the best so far and I'd have to agree. Nicole did a really nice job, as usual. You can click HERE to go to the press page on my web site and then from there go to the full article......Thank you Nichole and thanks to Lisa McQuaid, the art director who called for more info and photos. Nice job. However, my video IS on the HGTV web site. So you can go to my Press page HERE and simply click on the Modern Master's logo. Below is a screen capture of me lying on the very clean and newly painted floor of my studio while they were taping. It doesn't look near that good right now.